Even if you're not following the news about recycling and plastic pollution as closely as I am, you've probably seen some of the articles (try this one or this one or this set of photographs to start) or noticed that your garbage company or city has changed the rules about recycling of late. The shake up in recycling is caused by the fact that China - who used to buy the vast majority of our recycling to process and turn into plastic pellets for sale - stopped accepting it in January of 2018 because it was too contaminated and was destroying what's left of their rather battered environment. Which leaves us with a whole lot of "recycling" on our hands. A few other countries in South East Asia have been accepting smaller amounts of it but they're getting quickly overwhelmed by both the sheer volume and the messy state it's in. Facing massive price increases from waste management companies, some U.S. cities and towns have recently stopped recycling altogether. Others are now burning it all in energy-producing facilities. While producing energy from a waste product is theoretically a good idea, it's undermined by the deeply negative effect this petrochemical infused smoke is having on air quality and public health. Nish-nish! It's a complicated mess -- our reliance on plastic, our mania for convenience and corporations' quests for ever-greater profits are turning our planet (especially our oceans) into a gigantic garbage dump that's killing marine life like sea turtles who routinely and understandably mistake plastic bags for jellyfish - one of their favorite foods. 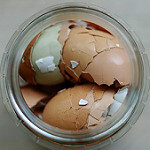 There is no natural process that can break down conventional plastics. As a result, nearly every piece of plastic ever produced is still with us either in a landfill, in our oceans or just lying along the roadsides. 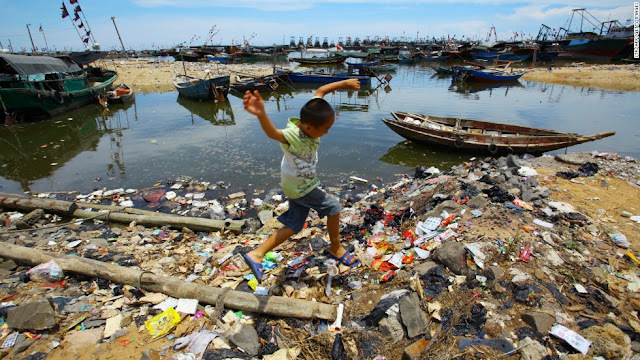 Plastic doesn't ever go away, it just breaks down into smaller and smaller pieces that eventually infiltrate our groundwater, soil, food and air, filling our bodies with bad chemicals that increase our risk of cancer and other ills. That's the bad news. The good news is that there are two levels of solutions you can pursue: personal solutions and policy solutions. Although this post will focus on the personal, I want to be clear that while personal solutions are important, policy solutions are actually far more important and effective. We can't just switch to glass storage containers and metal straws and call it a day, we have to push for systemic changes on a much larger scale. I plan to write a series of other posts on the policy solutions with clear, simple instructions on how you can help tackle things like banning plastic bags, straws and polystyrene foam in your community and putting pressure on manufacturers to change the way they package their products. But since I know you probably spend a decent amount of time in your kitchen, we'll start today with some simple changes you can make in your own life right now. Some of these may be tougher for you than others. Most will take some repetition to cement them into habit but you'll feel much better about your impact on the world. If this list overwhelms you, just pick one or two to start, bookmark this post and come back to it when you're ready to take on another one or two. 1. 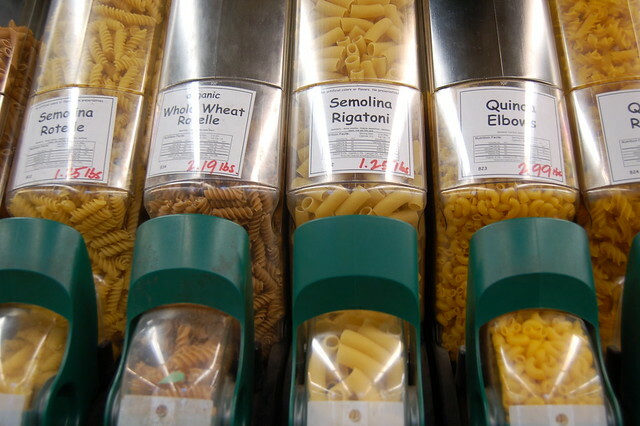 Stop using plastic wrap - it's bad news. 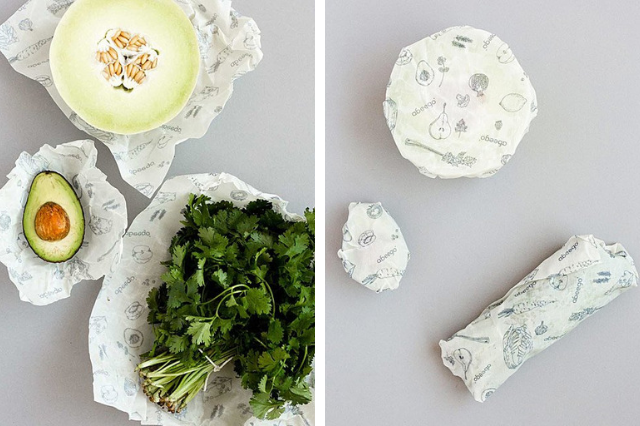 Try one of the wax-infused fabrics like Abeego, Bee's Wrap or other brands or make your own which is significantly cheaper and could be a good project to do with any kids in your life as most kids love wax! You can also get a set of silicone stretch lids to cover bowls and pots. Even easier, you can do what I do and simply cover the bowl with a clean plastic produce bag or a plate that's the right size - both work well and are don't cost a cent. 2. Stop buying foods and other things packaged in plastic. 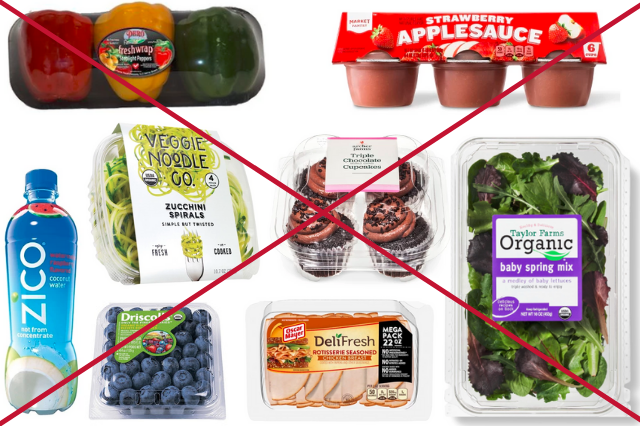 Just say "no" to foam trays, blisterpacks, clamshells, shrink wrap, plastic wrap, and the like. 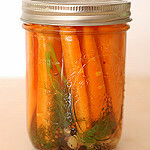 If you can't buy it in bulk (see below) or get it at your farmers market or in your CSA box, opt for a version sold in glass, cardboard or metal. And while you're resisting, it would be very helpful if you politely told the store manager that you are not going to buy things packaged in plastic and urged her or him to consider choosing other products. 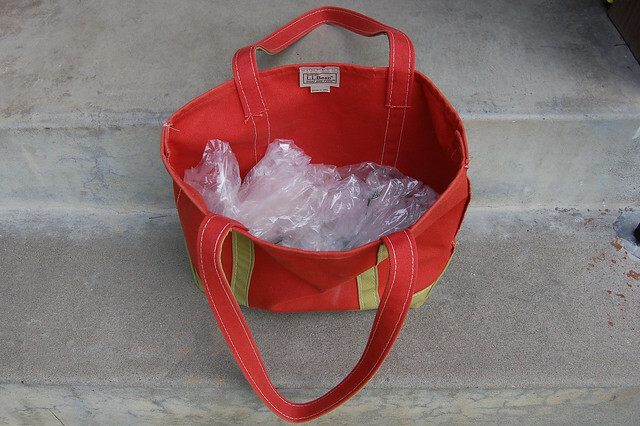 One of my many tote bags filled with cleaned, dried, reused plastic bags for produce. 5. 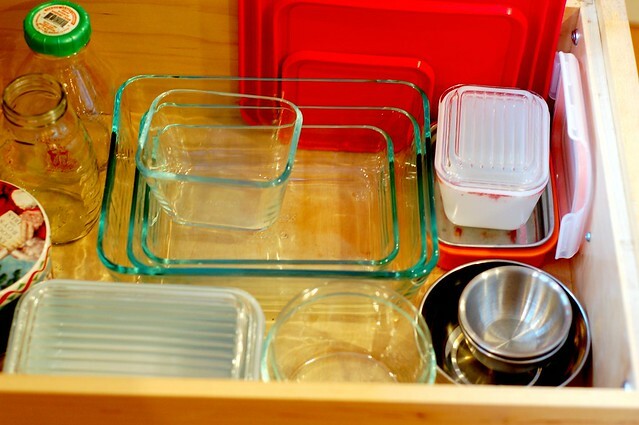 Replace plastic tupperware with glass and metal storage containers. My previous advice on this quest is here and it's still all true. 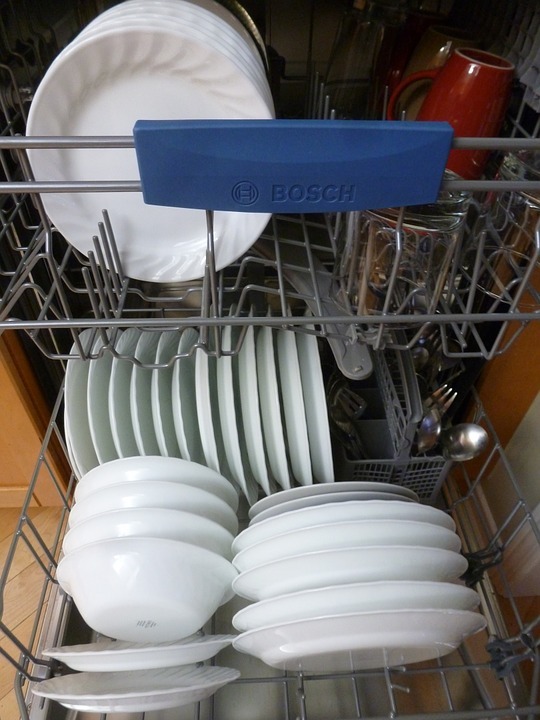 If you want recommendations, this 8-piece set with snap lids by OXO is nice as is this 9-piece set by Utopia. I like that both are made from borosilicate glass which means can withstand dramatic temperature changes without breaking (unlike frikking Pyrex whose parent company Corelle quietly switched to using cheaper, less durable glass in its U.S. products about 20 years ago...) I'm also partial Luminarc's glass working jars with lids which I like to use for things like salad dressing and yogurt. I do own a whole lot of glass Pyrex storage containers, too. 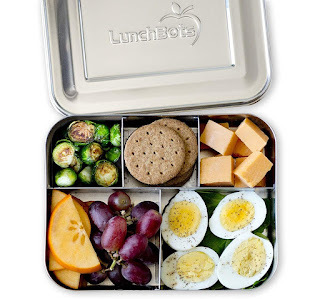 And we rely on a selection of metal Lunchbots bento box-style containers and Konserve round containers that see heavy use in our kids' lunches. 6. Don't succumb to plastic cutlery - bring your own set of reusable cutlery with you. When I was in college (twenty years ago - how did that happen? !0, I bought a bunch of sets of metal knife, fork and spoon on a ring and gave them to all my friends and family in little canvas carrying sacks I'd made. I still have mine and they're in perfect shape although the canvas carrying bag is rather dirty - I keep them in my backpack so they're there when I need them. Others have had the same idea since and now there are similar sets made out of bamboo. I am also intrigued by this folding metal spork and this 5-in-1 combination deal (though it has a plastic handle.) 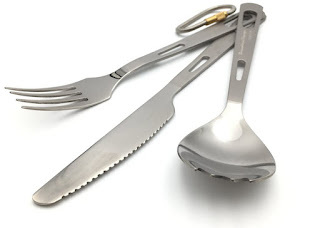 You really do not have to buy anything to embrace this concept - just take your smallest fork, knife and spoon and put them in a small carrying case. 7. Skip the plastic straw - you can bring your own stainless steel or bamboo straw or just (gasp!) drink straight from your reusable cup or mug. 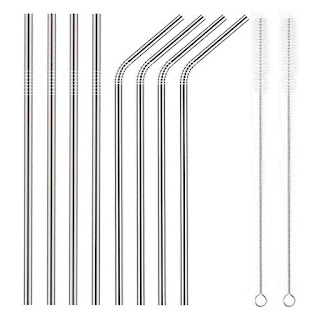 I bought a four-pack of these metal straws years ago - they're indestructible. 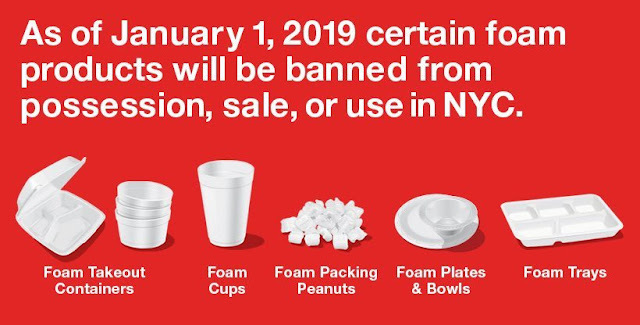 You can also get glass straws but it seems like asking for trouble to me, particularly if you're going to carry it around with you. 8. Use actual cutlery, plates, cups and napkins next time you host a party or event and plan to just wash it all after the fun is over. 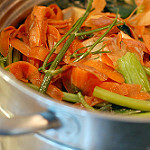 Don't forget to put out separate bins for food scraps to compost and for any recyclable cans and bottles. It might take a few dishwasher runs to get through it all but don't you want your kids to inherit a habitable planet?! If it's a really big event, you can rent dishes, glassware, silverware and napkins. 10. Bring your own mug or cup when you get coffee, tea, a smoothie or other drinks out. There are some great options out there nowadays including this double walled glass travel mug, this insulated steel mug and this insulated stainless steel tumbler. If you have time to sit down, just ask them to serve it in a china mug or a glass. 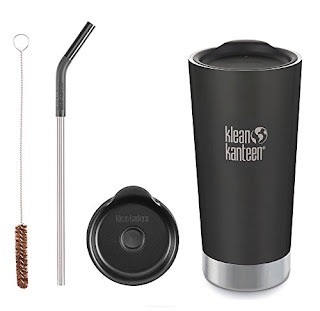 This fancy, insulated deal includes a steel top and straw - equally good for hot or cold drinks. 11. Do NOT buy water or other drinks in plastic bottles. In addition to littering the planet, they're bad for your own health (that leaching problem again). Bring a stainless steel or glass water bottle with you and use it, instead. I am a loyal Kleen Kanteen user and also really like these Hydroflask insulated water bottles. Glass is a good if somewhat heavier and more fragile option (better for adults, methinks) and Lifefactory has some nice ones. 13. Wash and reuse Ziploc and other plastic bags as well as sturdy plastic containers from yogurt, sour cream, cream cheese, etc. Use them until they finally give out. 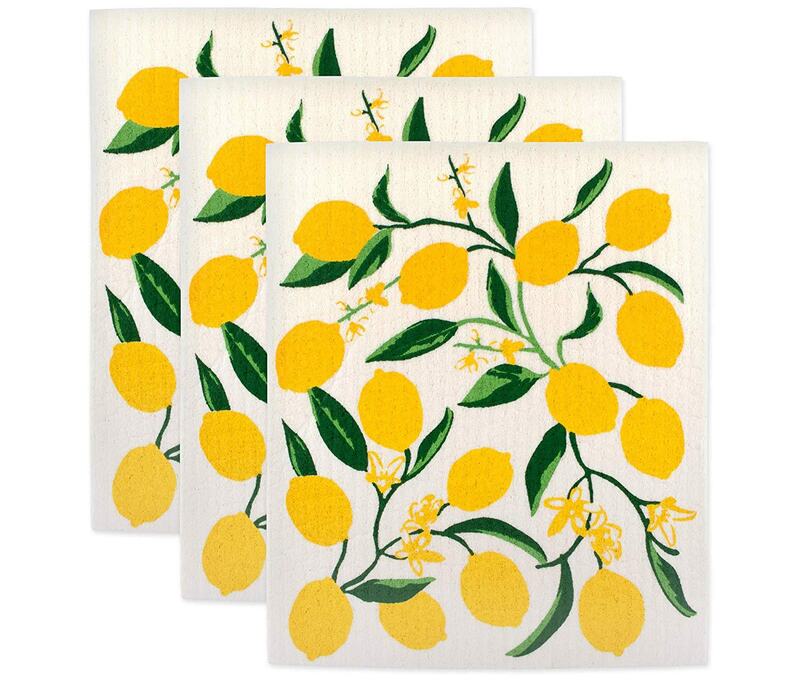 When they do give up the ghost, replace them with a set of washable cotton produce bags like these. Meanwhile, you've been buying in bulk, making your own yogurt and choosing milk and other products sold in glass bottles so you should not be collecting nearly as many of these containers anymore, right? 14. If you pack lunch, switch to metal containers and reusable sandwich and snack bags. 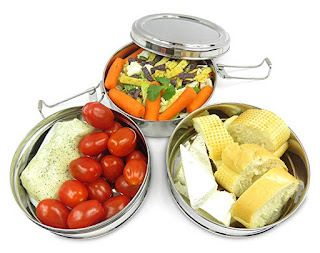 There's been a lot of innovation in the last decade so there are great options out there including my personal favorites, Lunchbots stainless steel divided bento box style containers. If you're looking for something to replace Ziplocs and sandwich bags, try Lunchskins and Stasher -- even though the Stasher bags are made of silicone - which is plastic - they are sturdy enough to last for years, taking them firmly out of the single use category. Of course you can always reuse plastic containers you have on hand - something we do every day along with our Lunchbots and reusable sandwich bags. 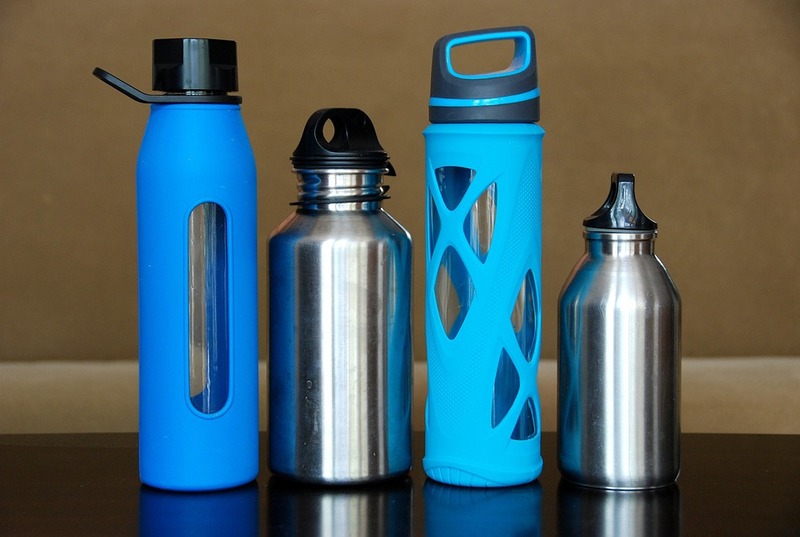 You've already got my recommendations on the best water bottles. 15. Stop using wipes. I know this is a tough one for parents of babies and toddlers (it's definitely hard for me!) but I read this article in the Atlantic recently and now I can't unsee it -- the term "fatberg" seems permanently etched in my memory 😱. Wipes are made from plastics and synthetic cellulosic fibers that will never fully degrade but instead break into microplastics which transmit harmful chemicals to marine wildlife (and ultimately, to us). So it's back to toilet paper, washcloths, rags and good old-fashioned soap and water to clean our dirty butts and kitchen counters. 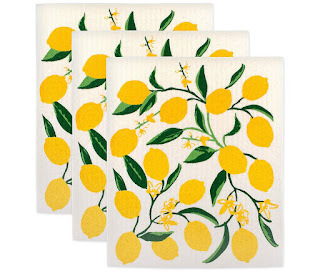 If you don't already have a set, try these fabulous Swedish cloths in lieu of wipes or paper towels. Environmentally-friendly (made from cotton and wood pulp-derived cellulose), washable, durable and cute to boot. If you made it all the way to the end of this post, I am very impressed as I know it's been a long one. 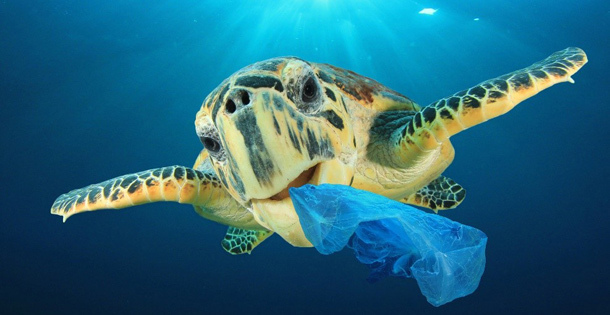 Feel free to leave me a comment here to let me know where you are in the journey to cut plastic out of your life. I am curious about what's been hardest and easiest for you to change and eager to hear any tips and tricks you want to share. These tried and true favorites make the most of what's fresh right now. 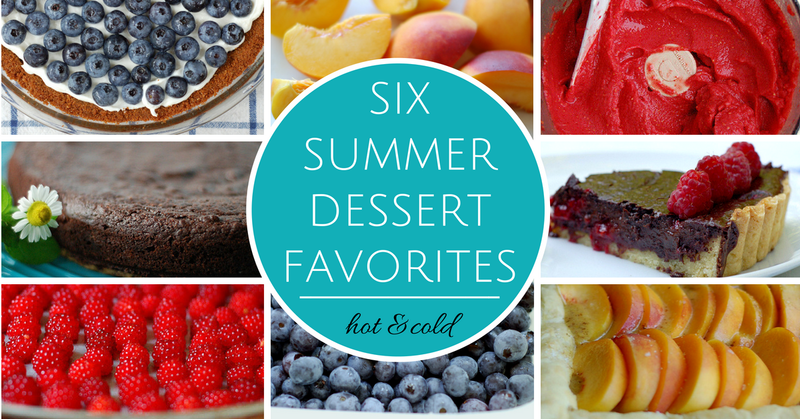 Enjoy these six sweet ways to celebrate July's bounty of blueberries, peaches, raspberries and more. This chilled tart is the perfect way to end to a hot day. Drained Greek yogurt sweetened with a little honey provides a creamy, slightly tangy base for the fresh blueberries that are just coming into season. 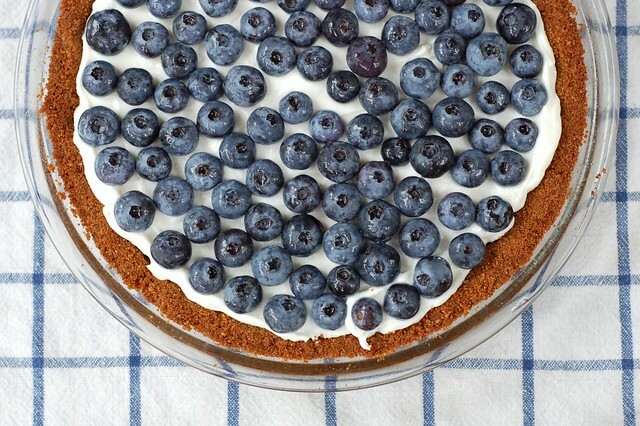 The crystallized ginger in the graham cracker crust adds a fabulous little zing. Wineberries are invasive but so tasty that I forgive them (more info on foraging for them here). 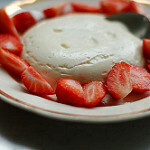 Go pick some, then turn whatever actually makes it home with you into this refreshing, simple dessert. 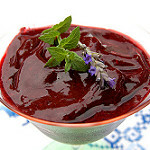 If you don't have wineberries, you can still enjoy this quick, cool dessert with good old raspberries. 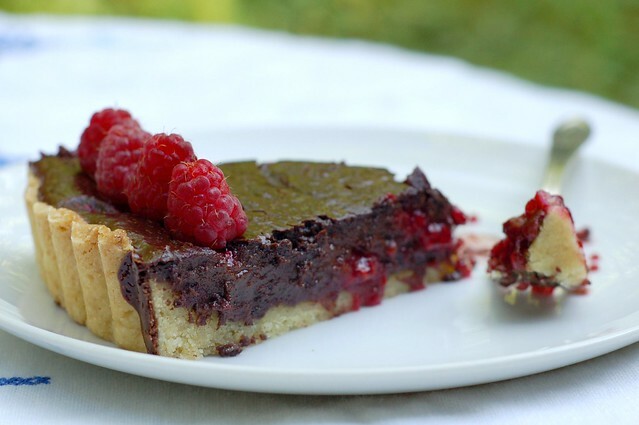 A buttery shortbread crust holds this out-of-this-world combination of chocolate and raspberries. It is so good! It takes a bit more time to prepare than most of the recipes here but is well worth the effort. 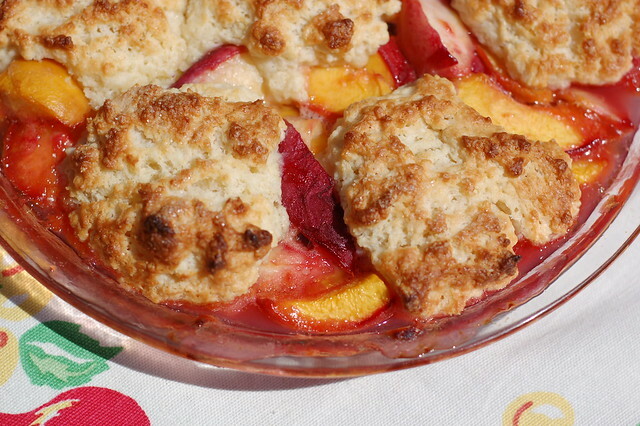 This is one of my go-to summer desserts. 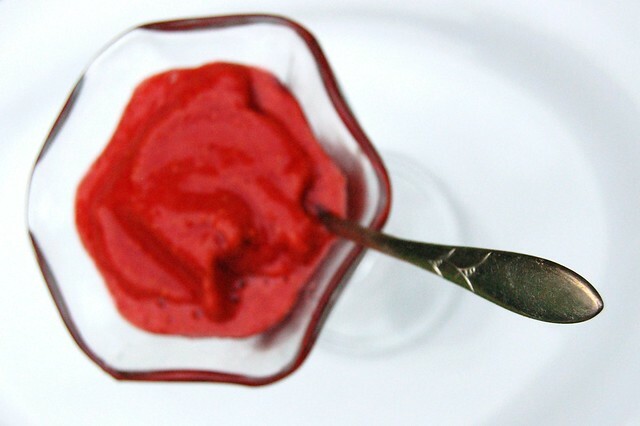 This perfect recipe comes courtesy of a Cook's Illustrated many years back. The biscuits are made with yogurt and come together quickly. You do have to turn the oven on but not for very long - less than half an hour total. Always a hit! 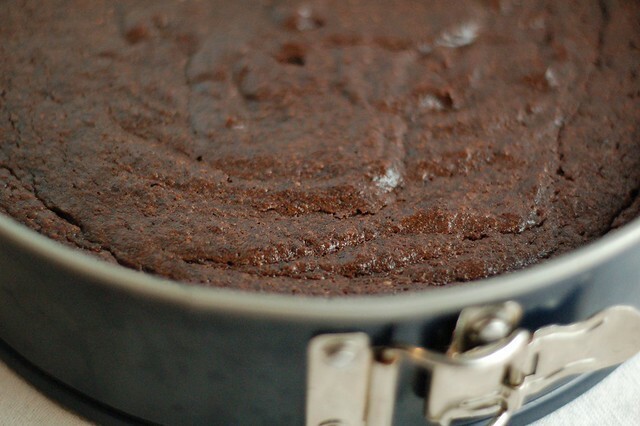 This lovely chocolate cake gets both moisture and some of its sweetness from the beets that are just coming into season. Adapted from Sarah Raven's lovely cookbook, Fresh From The Garden, this cake has a perfect crumb and a fantastic, sophisticated flavor profile. You can drizzle with a chocolate glaze or serve it with fresh whipped cream sweetened with a little maple syrup. 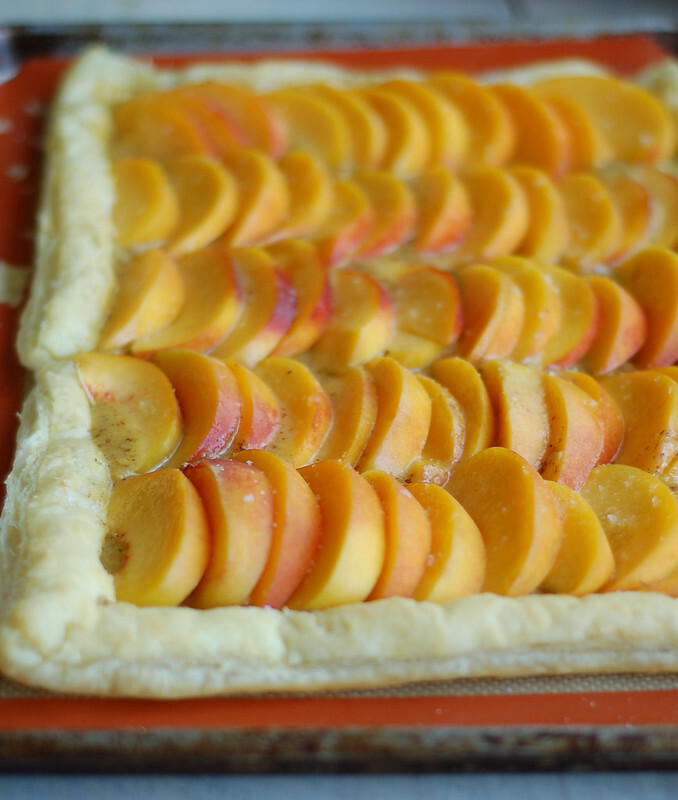 This lovely, rustic tart pairs the juicy sweetness of fresh peaches with the rich, nuttiness of frangipane nestled in a flaky, buttery crust. 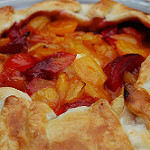 I use store-bought puff pastry to make life easier. Dufours puff pastry is the gold standard if it's available near you (though it is NOT cheap) (if you use it regularly enough, you can buy a 10-pack on Amazon) but any brand will yield a reliably tasty tart crust. After that long,frigd winter, I'm particularly grateful for all the bright, fresh flavors popping in my garden right now. It's luxurious to walk outside to gather a few sprigs of dill for my morning eggs, some basil leaves for garlic bread, a handful of cilantro to garnish a stir-fry or a few fuzzy leaves of apple mint to add to a cucumber-yogurt sauce. To make these lovely flavors last beyond the summer, I rely primarily on the freezer. 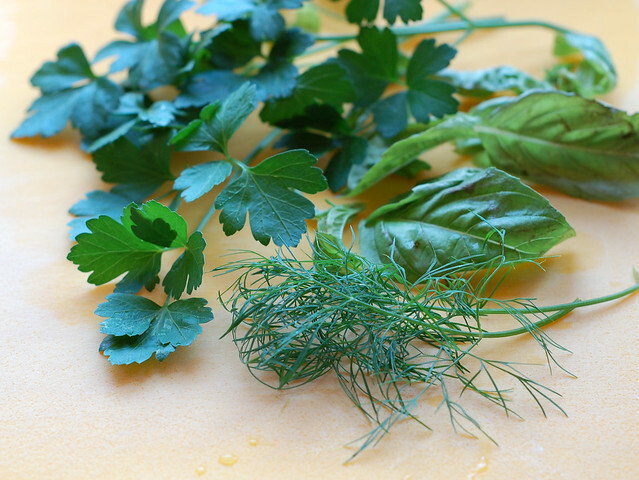 I like to freeze chopped, fresh dill, parsley, cilantro and basil as they hit their stride. It's easy- just rinse and dry them, take the leaves off the stem, chop coarsely, mix with a little olive oil and fill an ice cube tray with the bright green paste. 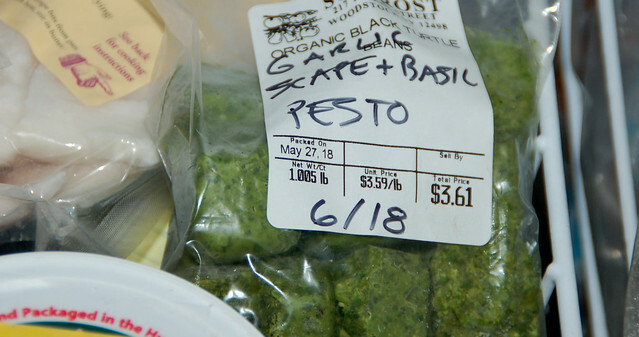 Once they've frozen fully, pop the fresh herb cubes out and store them in a heavy duty freezer bag for up to a year. But don't forget to label the bag - it can be difficult to tell which green thing is in there once you've got a shelf full of them. 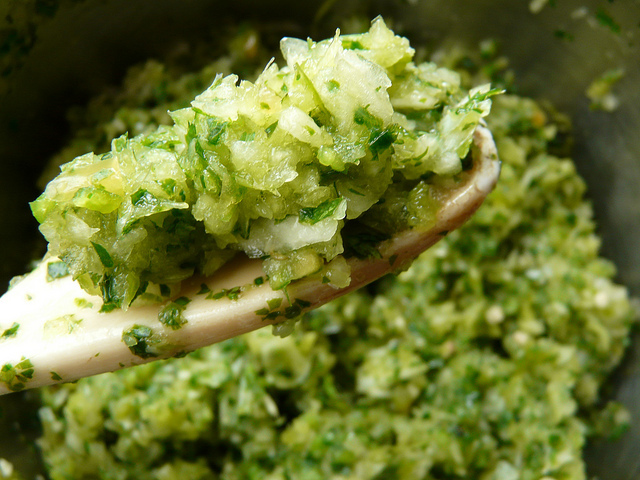 I also like to make big batches of pesto - both regular and garlic scape pesto - to freeze for the year ahead. All you have to do is toss a couple of these little, green bricks into a pot of hot, buttered pasta or a pan of polenta or risotto and you've got an instant, summer-infused treat. 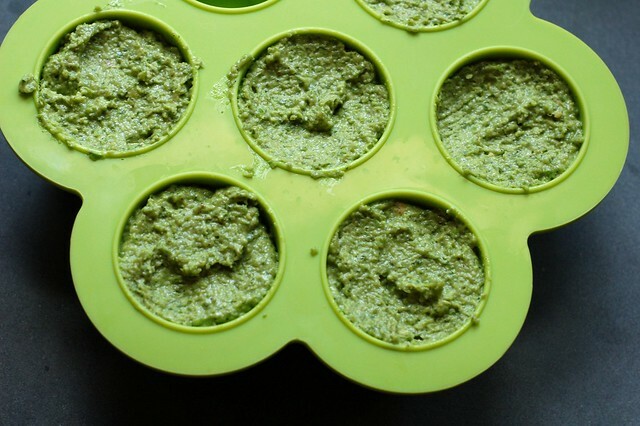 The only difference from the herbs above is that I sometimes opt to freeze the pesto in larger portions in these great Beaba silicone trays I bought to freeze baby food for our first son 10 years ago. We're way past that stage now but still use them all the time. 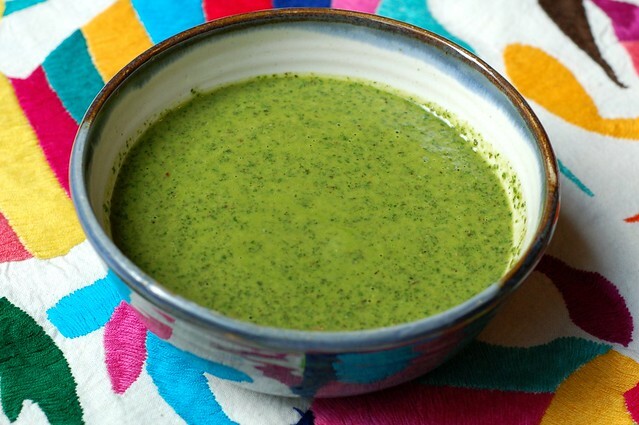 My friend, Liza recently told me she freezes her homemade chimichurri sauce -a great idea! So I made a big batch this morning with our cilantro, parsley and oregano and froze half of it. Once tomato season arrives, I will roast them with tons of of thyme, basil, oregano and rosemary and freeze them in quart bags. One thing I love about this technique is that you can use herbs that are already flowering and you don't even need to remove the stems. 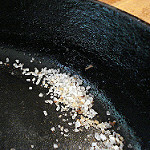 My buddy Liza also gave me the idea of making sofrito - the base for many Spanish and Caribbean dishes - and freezing it. 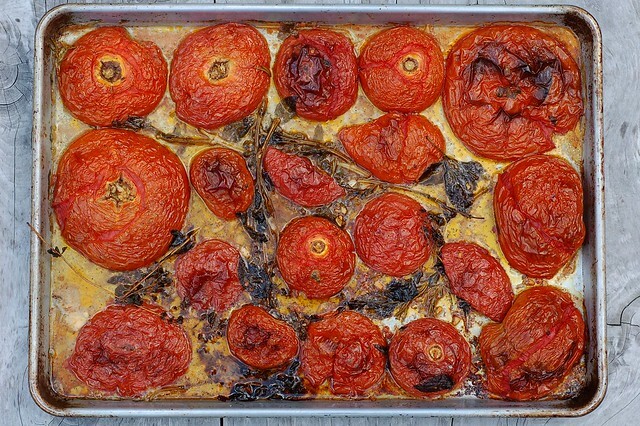 Check out Nourished Kitchen's recipe for Spanish-style sofrito here - this one, which is cooked first, includes tomatoes rather than peppers and features Mediterranean herbs- rosemary and thyme. Or try Serious Eats Puerto Rican style sofrito which is raw and features peppers and culantro (you can substitute cilantro). Liza also adds a little oil to the batch she plans to freeze so she can just pop a cube into the pan and get cooking. 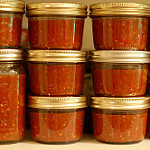 Once pepper and tomato season rolls around, I plan to make both kinds and freeze them. Although the freezer is my favorite, I also dry fresh sage, mint, rosemary, oregano and summer savory. 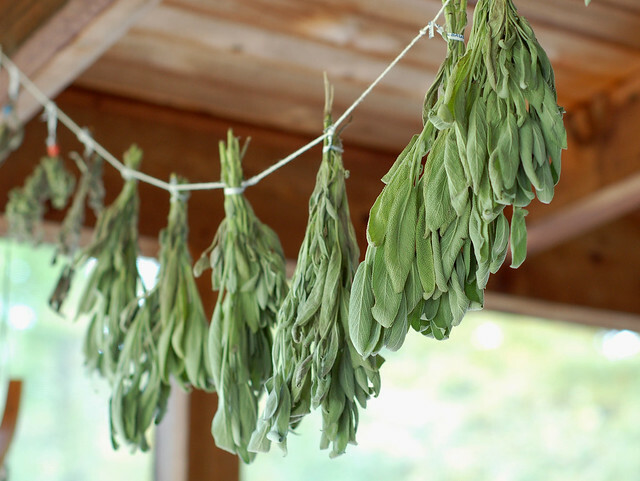 You just rinse the herbs, dry them thoroughly then hang in a dry, covered location that is out of direct sunlight, has good ventilation and no mold issues. 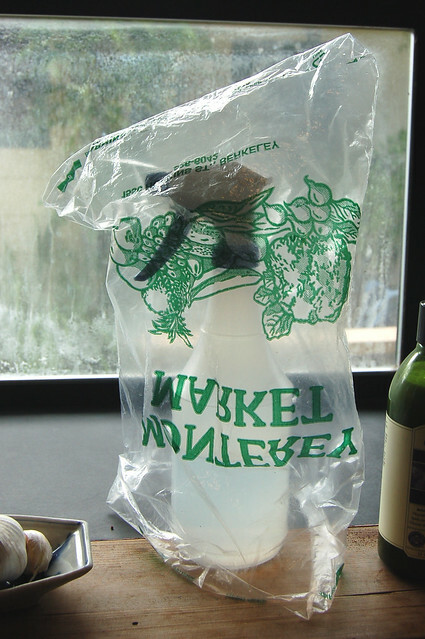 Make sure not to overfill your bundles or hang them too close to each other - you want the air to reach everywhere. 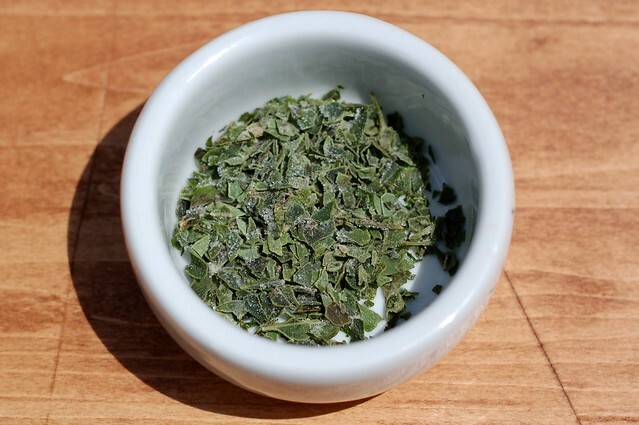 Depending on the weather conditions and the herbs you've chosen, it can take up to two weeks for them to dry out fully--you're looking for a crispy crunch when you crumble them between your fingers. If its been rainy out, I'll pop them into the food dehydrator for an hour or so to finish them off. 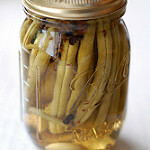 Once they're bone dry, I crumble them into a Mason jar, cap them and store in my cool, dark, dry pantry. There is little I find as satisfying as filling my freezer and pantry with delicious things to eat. Primal urge to survive the winter in style - ✔.